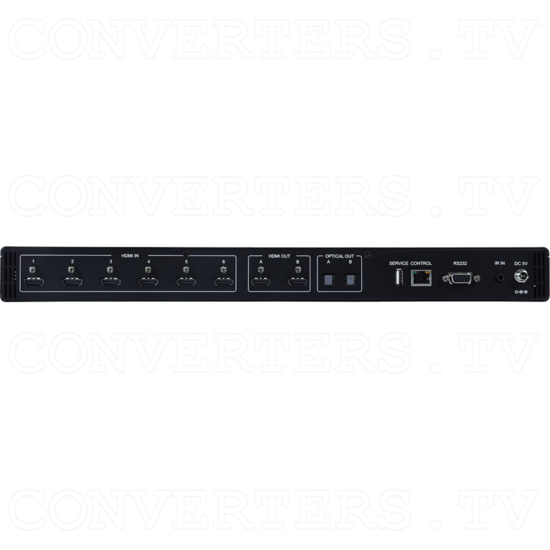 New 6 input 2 output 4K UHD HDMI Matrix with 6G Capability connects and switches six (6) 4K UHD HDMI signals between two (2) 4K UHD HDMI displays. The 6 input 2 output 4K UHD HDMI Matrix with 6G Capability fully supports 18Gbps (600MHz) resolutions, including 4K@60Hz (4:4:4, 8-bit), 16-bit Deep Colour up to 1080p@60Hz, HDR High Dynamic Range and HD audio, plus other features as defined by HDMI 2.0 specifications. A comprehensive EDID management system has the ability to select between in-built default EDID's or EDID's as copied from attached sinks (HDTV's). This flexibility can solve any HDTV display issue, allowing for a more robust video network. Digital audio signals can be extracted from either of the output HDMI streams and relayed out to an external sound sytem in LPCM 2.0CH and standard digital Bitstream formats. Programmable pre-sets are also available and assist to simplify the routing setup. 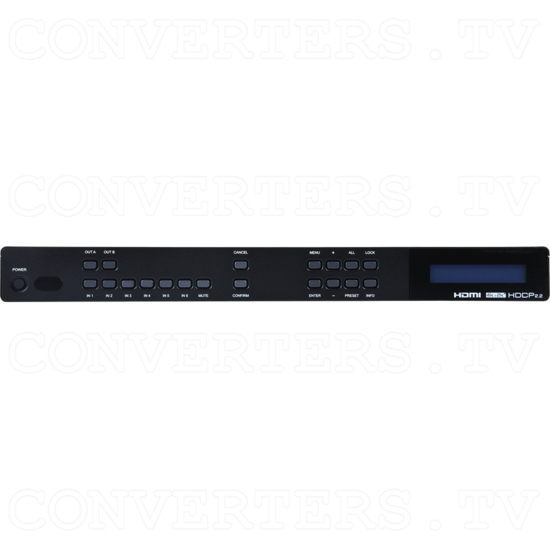 Setting up and controlling the 6 input 2 output 4K UHD HDMI Matrix with 6G Capability is achieved a number of ways, from simplified front-panel buttons with an LCD readout and hand-held remote, to internet based PC control using WebGUI/TelNet and RS-232 protocol commands. A versatile product designed to give maximum response and control over 4K UHD video signals for perfect video and audio replay and display. The 6 input 2 output 4K UHD HDMI Matrix with 6G Capability fully supports 18Gbps (600MHz) resolutions, including 4K@60Hz (4:4:4, 8-bit), 16-bit Deep Colour up to 1080p@60Hz, HDR High Dynamic Range and HD audio, plus other features as defined by HDMI 2.0 specifications. A comprehensive EDID management system has the ability to select between in-built default EDID's or EDID's as copied from attached sinks (HDTV's). This flexibility can solve any HDTV display issue, allowing for a more robust video network. Digital audio signals can be extracted from either of the output HDMI streams and relayed out to an external sound sytem in LPCM 2.0CH and standard digital Bitstream formats. Programmable pre-sets are also available and assist to simplify the routing setup. 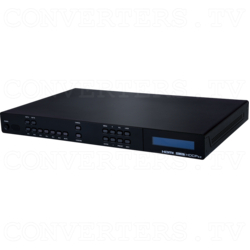 Setting up and controlling the 6 input 2 output 4K UHD HDMI Matrix with 6G Capability is achieved a number of ways, from simplified front-panel buttons with an LCD readout and hand-held remote, to internet based PC control using WebGUI/TelNet and RS-232 protocol commands. A versatile product designed to give maximum response and control over 4K UHD video signals for perfect video and audio replay and display.